Parents of small children face a multitude of emotional, physical and economic challenges. While Domtar can’t tackle them all, our Personal Care products address two important ones: keeping babies dry and keeping diapers affordable. Recent diaper innovations help us do both. For parents of infants or children with a disability or illness, incontinence can be especially challenging. With this in mind, Domtar set out to make our line of Comfees® baby diapers more comfortable and absorbent. Some of these diaper innovations are a direct result of the work done by Domtar’s research lab. Our research and development scientists tested different combinations of materials and developed several proprietary features, which help create the best products for Comfees, as well as for our retail partners. For example, the newly-developed Comfees Premium Diapers have an ultra-absorbent core that provides up to 12 hours of leakage protection, and they have stretch fasteners and a shape that hugs a baby’s body for a secure fit. The diapers are also unusual in that they are available up to size 7, a size not offered by most other brands. 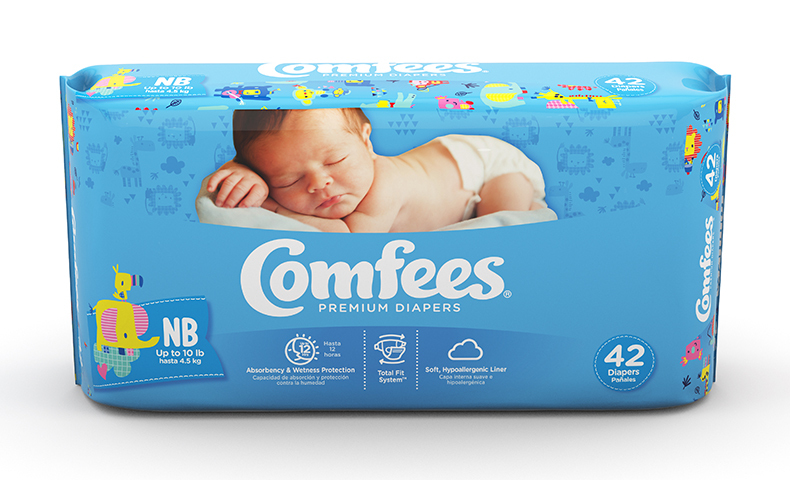 These diaper innovations were incorporated into Comfees products without increasing the price, which was an important goal. Comfees Premium Diapers are available to parents through home health care channels, and the cost of the diapers is typically reimbursed through government programs in the United States. Comfees products can also be purchased at an affordable price through several online retailers. Diapers are a significant expense for families, especially families already living on low incomes. The National Center for Children in Poverty estimates that more than 5.5 million children in the United States under age 3 who live in low-income households lack an adequate supply of diapers. Diaper poverty can lead to serious health consequences and emotional trauma. Babies who remain in soiled diapers for too long are exposed to the potential health risks associated with diaper rash. Domtar diapers help combat these issues. We offer high-quality, affordable products by working with national retailers to develop exclusive store brands. We also produce our own brand of low-cost diapers—Fitti® diapers—sold through small retail outlets, such as corner stores and pharmacies, that often are located in urban areas. Domtar is also fighting diaper poverty through our Comfort and Care diaper donation initiative, which provides a process for donations to diaper assistance organizations. This helps alleviate the financial and emotional distress of diaper poverty. Learn more about diaper poverty and how Domtar helps fill the gap for families that need diapers.